1استاد، گروه اقتصاد کشاورزی، دانشکده کشاورزی، دانشگاه فردوسی مشهد. 2دانشجوی دکتری اقتصاد کشاورزی، دانشکده کشاورزی، دانشگاه فردوسی مشهد. زعفران ایران از لحاظ کمی و کیفی از جایگاه نمایانی در سطح بین­المللی برخوردار است و با بهره­گیری از ظرفیت موجود می­توان درآمدهای صادراتی حاصل از آن را به­طور قابل ‌ملاحظه‌ای افزایش داد. از سوی دیگر، پیش­بینی فروش بر اساس تجزیه ‌وتحلیل سری زمانی یک عنصر بسیار مهم در طراحی و اجرای استراتژی­های بازاریابی در عرصه­ی بین­المللی است. اما رویکرد­های متداول پیش­بینی با نادیده گرفتن ساختار خطی یا غیرخطی داده­ها نتایج دقیقی را ارائه نمی­دهند. لذا، هدف اصلی این مطالعه طراحی یک مدل هیبرید متشکل از دو روش شبکه عصبی مصنوعی (ANN) و ﺧـﻮد ﺗﻮﺿـﻴﺢ ﺟﻤﻌـﻲ ﻣﻴـﺎﻧﮕﻴﻦ ﻣﺘﺤـﺮک (ARIMA) به‌منظور رفع نواقص و استفاده از ویژگی­های منحصر به‌فرد هر یک از این مدل­ها است. با استفاده از داده­های مربوط به صادرات زعفران ایران طی دوره­ی 1392-1283، نتایج مطالعه نشان داد که مدل هیبرید ARIMA-ANN در مقایسه با مدل­های ARIMA و ANN از عملکرد بهتری در پیش­بینی صادرات زعفران ایران برخوردار است. لذا، با توجه به کارایی شایان توجه مدل هیبرید ARIMA-ANN، استفاده از این مدل در تنظیم استراتژی­های مربوط به صادرات در بازارهای جهانی زعفران و همچنین در پیش­بینی متغیرهای سری ­زمانی توصیه می­گردد. In terms of quality and quantity, Iranian saffron has a considerable position at the international level and by taking advantage of the existing capacity; we can significantly increase the export earnings from it. On the other hand, sales forecasting based on time series analysis is s a very important element for the designing and implementing of marketing strategies in the international arena. However, the conventional approaches to forecasting, by ignoring the linear (or nonlinear) structure of data, do not provide accurate results. Therefore, the main objective of this study is to design a hybrid model consisting of two methods, artificial neural networks (ANN) and autoregressive integrated moving average (ARIMA), in order to overcome the deficiencies and the use of the unique features of the each of these methods. Using the data related to the export of Iranian saffron during the period 1904-2013, the results of the study showed that the ARIMA–ANN hybrid model is stronger and better performance than ARIMA and ANN individual models in order to forecasting of Iranian saffron export. Therefore, given the considerable performance ARIMA–ANN hybrid model, the use of this model is recommended in setting strategies related to the export and also in the forecasting of the forecasting of time series variables. Ahmad, H.A., Dozier, G.V., and Roland, D.A. 2001. Egg price forecasting using neural networks. Journal of Applied Poultry Research 10 (2): 162-171. Aydin, G. 2014. Modeling of energy consumption based on economic and demographic factors: The case of Turkey with projections. Renewable and Sustainable Energy Reviews 35: 382-389. Church, K.B., and Curram, S.P. 1996. Forecasting consumers' expenditure: A comparison between econometric and neural network models. International Journal of Forecasting 12 (2): 255-267. Co, H.C., and Boosarawongse, R. 2007. Forecasting Thailand’s rice export: Statistical techniques vs. artificial neural networks. Computers and Industrial Engineering 53 (4): 610-627. Dalena, M., and Magazzino, C. 2012. Public expenditure and revenue in Italy, 1862–1993. Economic Notes 41 (3): 145-172. Feng, L., and Zhang, J. 2014. Application of artificial neural networks in tendency forecasting of economic growth. Economic Modelling 40: 76-80. Ghorbani, M. 2008. The efficiency of saffron’s marketing channel in Iran. World Applied Sciences Journal 4 (4): 523-527. Jeong, K., Koo, C., and Hong, T. 2014. An estimation model for determining the annual energy cost budget in educational facilities using SARIMA (seasonal autoregressive integrated moving average) and ANN (artiﬁcial neural network). Energy 71: 71–79. Jha, G.K., and Sinha, K. 2013. Agricultural price forecasting using neural network model: An innovative information delivery system. Agricultural Economics Research Review 26 (2): 229-239. 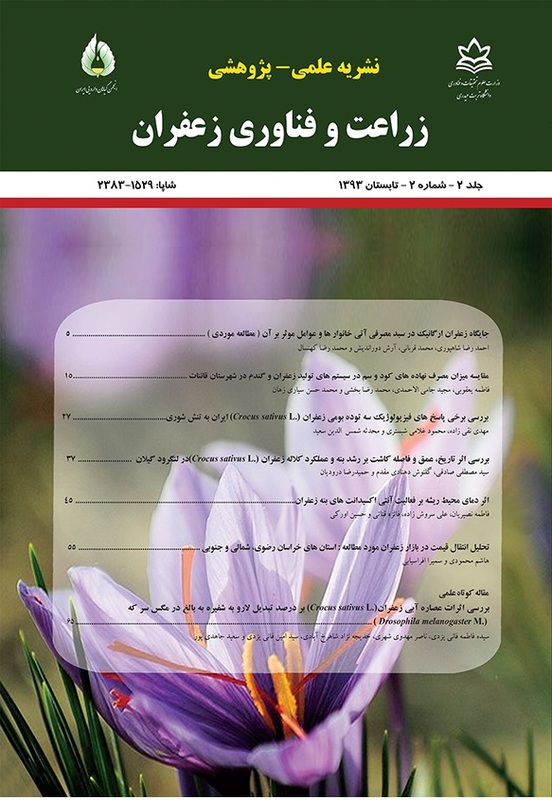 Kheirkhah, A., Azadeh, A., Saberi, M., Azaron, A., and Shakouri, H. 2013. Improved estimation of electricity demand function by using of artiﬁcial neural network, principal component analysis and data envelopment analysis. Computers and Industrial Engineering 64 (1): 425-441. Lee, Y.S., and Liu, W.Y. 2014. Forecasting value of agricultural imports using a novel two-stage hybrid model. Computers and Electronics in Agriculture 104: 71-83. Mishra, G.C., and Singh, A. 2013. A study on forecasting prices of groundnut oil in Delhi by ARIMA methodology and artificial neural networks. Agris on-line Papers in Economics and Informatics 5 (3): 25-34. Najarzadeh, R., Reed, M., Saghaian, S., Aghaei, M., and Rezagholizadekh, M. 2011. A study of Iran’s comparative costs in saffron. Journal of International Agricultural Trade and Development 7 (1): 59-69. Portugal, M.S. 1995. Neural networks versus time series methods: A forecasting exercise. Revista Brasileira de Economia 49 (4): 1-20. Singhal, D., and Swarup, K.S. 2011. Electricity price forecasting using artiﬁcial neural networks. International Journal of Electrical Power and Energy Systems 33 (3): 550-555. Tkacz, G. 2001. Neural network forecasting of Canadian GDP growth. International Journal of Forecasting 17 (1): 57-69. Ullrich, C. 2009. Forecasting and hedging in the foreign exchange markets. Springer Science and Business Media. Winklhofer, H., and Diamantopoulos, A. 2003. A model of export sales forecasting behavior and performance: development and testing. International Journal of Forecasting 19 (2): 271-285. Yim, J., and Mitchell, H. 2005. Comparison of country risk models: hybrid neural networks, logit models, discriminant analysis and cluster techniques. Expert Systems with Applications 28 (1): 137-148. Zhang, G.P. 2003. Time series forecasting using a hybrid ARIMA and neural network model. Neurocomputing 50: 159-175.